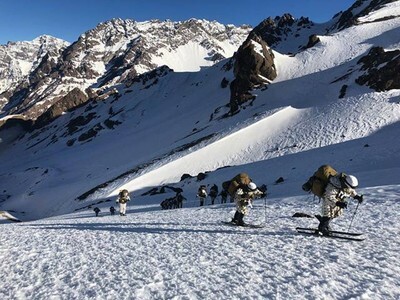 Soldiers training at the Chilean Mountain Warfare School quickly learn why it is one of the most respected climbing and survival schools anywhere. The rock climbing requires Soldiers to make their own routes up cliff faces, day and night, and secure their own anchors with their climbing partners. For many of the Soldiers, it is the toughest course they will ever complete. Staff Sgt. Norberto Rodriguez, of the 10th Mountain Division’s Light Fighters School, spent five months training in the Chilean Andes alongside students from across central and South America. His experiences are unique as one of a very small number of American Soldiers who have successfully completed this world-renowned mountain warfare and survival course. “When you’re with another army for five months, you learn a lot. You learn how they work. It’s not the same as deploying with another army,” said Rodriguez. While he is no stranger to the cold and snow, being stationed at Fort Drum, the winter conditions while training in the Andes were very different from the weather and geography of upstate New York. Rather than only see the obstacle, Rodriguez chose to see it as a challenge and an opportunity to better himself. Mountain warfare is not new as a discipline. At the United States Army Mountain Warfare School, they train Soldiers from across the Army on how to fight effectively in mountainous areas of operation. “Mountain warfare is an important discipline because it essentially adds another major plane of maneuver -the Z axis [for vertical infiltrations]”, said Capt. Nathan Fry of the U.S. Army Mountain Warfare School in Vermont. Fry further established that understanding how to use terrain effectively is a major mobility enabler, especially in the vertical terrain of rugged mountains. “To be successful in operations such as this, mountain warfare units must have soldiers who understand how to live unplugged and off-the-grid…and know how to dress for wild temperature swings, travel light enough to gain thousands of vertical feet in a single day, procure water, and avoid hazards such as rock falls or avalanches,” Fry stated. The Chilean Mountain Warfare School uses its proximity to the Andes to its advantage when training students. Many of the students that graduate find careers in mountain rescue and specialized mountain infantry units. As an infantryman, Rodriguez has experienced many patrols, both in training and while deployed. Whether dismounted or from a vehicle, many Soldiers are often able to rely on support or resupply if it is needed during a mission. Mountain warfare units do not have readily available resupply options. “If you finish your water, you have to know how to search for more. And if you finish your food, you have to know how to hunt for it. That’s just one of the things that you learn quick. This is mountain warfare. It’s just different. It’s its own animal,” shared Rodriguez. The five-month course challenged Rodriguez every day. Across two seasons he trained on hand-to-hand combat and is now qualified in mountain survival and ski-borne tactical operations. He learned to work with pack mules in mountainous terrain in day and night operations, and became an experienced rock and ice climber. “I’ve always loved the outdoors. As an infantryman, you’re doing something wrong if you don’t. But before I went to the Chilean Mountain Warfare School, I wasn’t a rock climber. I wasn’t a skier. None of those things. Those are skills they gave me,” Rodriguez said. Rodriguez looks forward to sharing his new skills with his future Soldiers, and shared that wherever the Army sends him, he knows he has faced larger obstacles before.